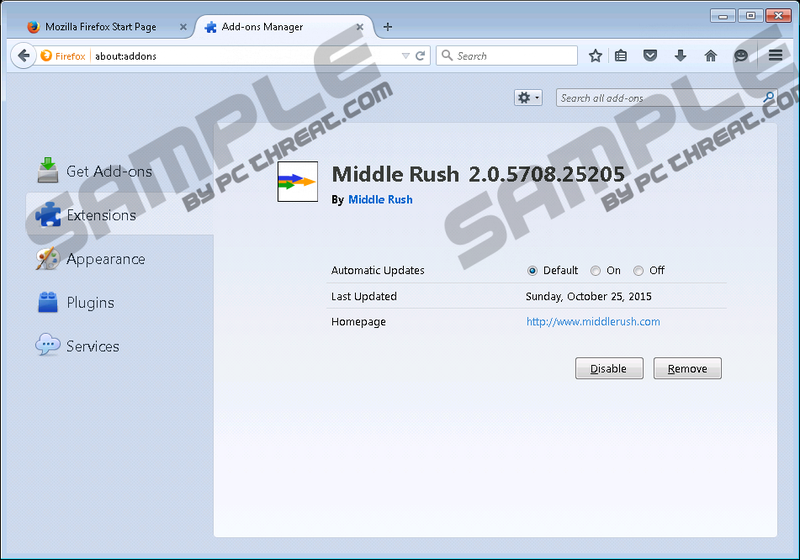 Middle Rush is another Injekt-based adware program. It is known to be a clone of Blazer Deals, Gravity Space, Jungle Net, and Deals Avenue, so it is not surprising for us at all that this program acts like the aforementioned programs. Middle Rush claims on its official website middlerush.com that it will “put you in the fast lane.” Unfortunately, this does not say much about the program itself and how it is going to act. In order to find out everything about Middle Rush, specialists at pcthreat.com have carried out a research. They have noticed that Middle Rush is going to show commercial advertisements only, so there is no point in keeping it installed on the system. You will be provided with all the necessary information regarding the Middle Rush removal in this article. It is not worth keeping adware programs installed because they not only show irritating commercial ads that appear on all kinds of web pages and often do not allow users to surf the web freely, but might also expose users to potential threats. Advertisements generated by Middle Rush are not very harmful themselves; however, they usually have links integrated into them and these links might redirect to third-party web pages. There is a very huge possibility that these ads will take you to the websites containing malicious software. Of course, we are sure that there might be some harmless web pages too among them. Another reason why you should not keep Middle Rush installed is that it tracks users and collects information about them. It has been found that it will record IP addresses, web pages visited, pages viewed, search queries, and other non-personally identifiable information. Luckily, it is not likely at all that Middle Rush will record personal information; however, you should still have to be cautious. In fact, it would be best if you eliminate Middle Rush completely. As you already know, Middle Rush has an official website; however, you will notice immediately that it is impossible to download it from there if you visit it. Of course, it is still possible to download this adware from third-party web pages; however, we believe that this program is mainly distributed using the bundling method. There is a possibility that you could have decline the installation of this program, so make sure that you do not hurry to install programs in the future and always read what it is written in the setup wizard. It would be also clever to install a security tool and keep it enabled. Threats will definitely not be able to enter your system if you do that. As Middle Rush is not a very harmful program, you will be able to remove it yourself. You just need to access Control Panel and get rid of this program from there. Use our manual removal instructions if you have never erased any kind of program yourself. You can also eliminate it by scanning the system with a reliable scanner SpyHunter. If you still decide to erase this adware manually, be sure that you delete those additional programs too. Right-click on Middle Rush and click Uninstall. Launch RUN and enter Control Panel in the box. Click OK.
Click the Uninstall button once again. Quick & tested solution for Middle Rush removal.